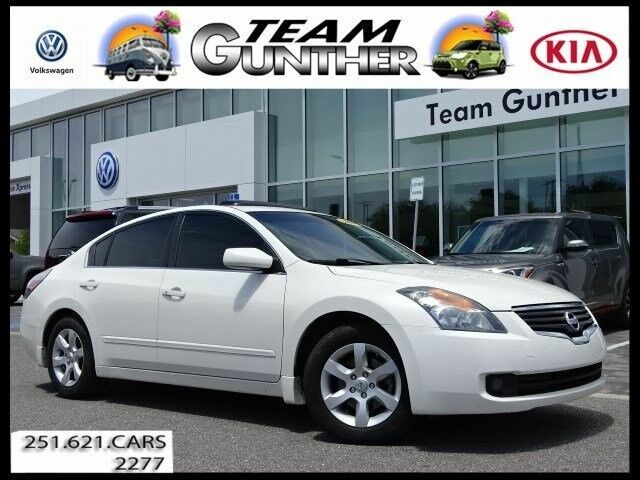 Contact Team Gunther Kia today for information on dozens of vehicles like this 2008 Nissan Altima 2.5 SL. This 2008 Nissan Altima comes with a CARFAX Buyback Guarantee, which means you can buy with certainty. The Nissan Altima 2.5 SL speaks volumes about it's driver, uncompromising individuality, passion for driving, and standards far above the ordinary. It's exceptional fuel-efficiency is a clear sign that not all vehicles are created with the same standards. Marked by excellent quality and features with unmistakable refined leather interior that added value and class to the Nissan Altima More information about the 2008 Nissan Altima: With styling that bears some resemblance to the much more expensive INFINITI G37 coupe, the new 2008 Nissan Altima coupe ranks as one of the most distinctive mid-size two doors, with a sportier character than competitors like the Toyota Solara and Chrysler Sebring. The Altima sedan also stands out in the crowd in terms of design, inside and out; it's offered in more color and interior combinations than is typical, its engines are among the most powerful in its class, and it has one of the best compromises of sharp handling and comfortable ride. Interesting features of this model are fuel economy (four-cylinder), well-balanced ride and handling, Powerful engines, unique interior, and stylish new coupe body style. Contact Team Gunther Kia today for information on dozens of vehicles like this 2008 Nissan Altima 2.5 SL. Your buying risks are reduced thanks to a CARFAX BuyBack Guarantee. Save money at the pump with this fuel-sipping Nissan Altima. You can finally stop searching... You've found the one you've been looking for. More information about the 2008 Nissan Altima: With styling that bears some resemblance to the much more expensive INFINITI G37 coupe, the new 2008 Nissan Altima coupe ranks as one of the most distinctive mid-size two doors, with a sportier character than competitors like the Toyota Solara and Chrysler Sebring. The Altima sedan also stands out in the crowd in terms of design, inside and out; it's offered in more color and interior combinations than is typical, its engines are among the most powerful in its class, and it has one of the best compromises of sharp handling and comfortable ride. Strengths of this model include fuel economy (four-cylinder), well-balanced ride and handling, Powerful engines, unique interior, and stylish new coupe body style.